‘This is a faithful saying and worthy of all acceptance, that Christ Jesus came into the world to save sinners…’ – 1 Timothy Ch1 v 15. The bus outreach has now been active for over 23 years. 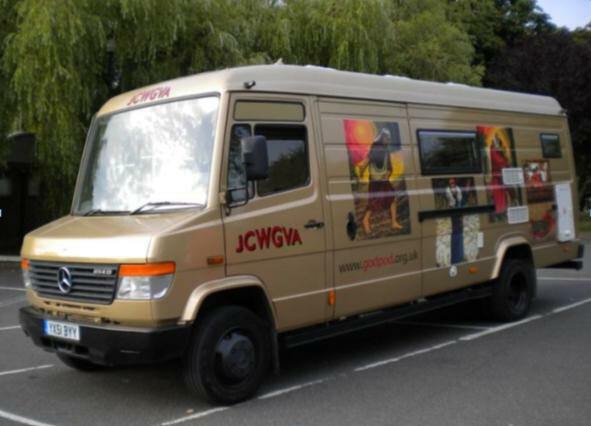 This outreach endeavors to share the gospel of Jesus Christ on the streets of the Isle of Wight and we are well known locally. This method has proven over the years to be a successful way of reaching those who, for a variety of reasons, may never hear of the good news of Jesus Christ. The team are now out five nights a week all of the year round. We also have a trust who meet at various times in order to steer the administration of the outreach prayerfully. Each of the team and trust are from different churches around the island, working together for the gospel in Christ. 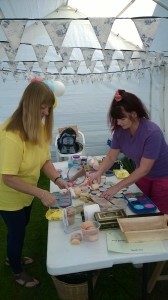 As an outreach we also play a part in the different county shows through the spring and summer months. We engage in different family activities like face painting, as well as to present a book stall and Christian tracts. 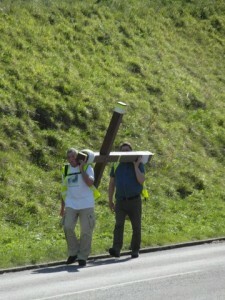 Each Easter time it has been regular for us to conduct a walk of witness through carrying the cross around the Isle of Wight over the first week of the holiday and finishing on Easter Sunday morning. On Good Friday the team work together for some street outreach in Newport town square. People will often see the initials of the outreach which are on the side of the bus and ask what the letters JCWGVA stand for. This name was introduced when the outreach became a registered charity. It may seen a bit of a mouthful in one respect but if talking to Christians it helps to explain our work as we are called to be witnesses and also we are in a spiritual battle. If those outside the body of Christ do inquire about it then we find it is a good conversation starter. Thank you for taking the time to view these pages and may our dear Lord richly bless you as you serve Him. The team and trustees. You may want to visit our Facebook page if you use social media in this way at www.facebook.com/godpod.iw . It is 17/2/19 @ 5.45am in a hotel and awoken by a fire alarm going off. After going around in a circle a few times my head settled down enough to put on some clothes and make our way to the assembly point. A lady asked “what is all the noise about”, we said it was the fire alarm going off and so she went back into her room. At the assembly point we were shocked to find only a handful of people out of about 250 people in the hotel as they never responded to the warning and sadly a great many today aren’t responding to the warning. Our God is indeed a consuming fire. Hebrews 12:29. He has graciously given His Son to be the fire chief of our salvation; the cross is the assembly point where no smoke or flames can touch us, for He truly is the fountain of life. We pray that many will respond to the Lord this Easter. To God be the glory through His Son by the blessed Holy Spirit. Much love in the Glorious Trinity, Mick. The bus ministry continues to operate 5 nights per week Monday to Friday by God’s grace. We value your ongoing prayers as we go out to each venue as seed sowers of the gospel and speak of Jesus to people. If you would like to support in prayer then email Dave Sibley on dave_lin@hotmail.com or phone 01983 854903. This Easter is a little later and we will be planning to walk the cross around the island once again as a witness. This will include the Good Friday street witness also at St James Square, Newport. Please see below for the schedule for the week’s activities. – Sunday 14th April 8.30am. Start from Ryde Elim, Albert Street, Ryde, via Puckpool, Seaview, St Helens, Bembridge, Sandown, Lake, Shanklin, top of Cowleaze Hill. – Monday 15th April 9.00am. From Cowleaze, Ventnor, Whitwell, Niton, Blackgang, Chale, Chale Green, Shorwell. – Tuesday 16th April 9.00am. From Shorwell Church, Brighstone, Brook, Chessell, Freshwater, Totland, Yarmouth. – Wednesday 17th April 9.00am. From Yarmouth, Shalfleet, Porchfield, Gurnard, Cowes, over floating Bridge, East Cowes. – Thurs 18th April 9.00am am. From East Cowes, Newport, Rookley, Godshill. – Friday 19th April 10.30am – 1.30pm – Street outreach St James Square, Newport. – Sunday 21st April 8.00am. From Crematorium, Wootton, Binstead and finish at Ryde Elim. If you would like to be involved then please contact by phone or email as detailed below. We plan to have 4 teaching weekends again this year through the visit of Paul Carter. Below is listed the first two of these. These dates can be also seen on our website www.godpod.org.uk. Anyone is welcome to come and join with us. For more info please phone one of the team. – Friday 29/3/19 7.30pm Wayfarers Fellowship, Castle Street, Carisbrooke. – Saturday 30/3/19 9.30am Wayfarers Fellowship, Castle Street, Carisbrooke. – Sunday 31/3/19 11.00am Bethany Evangelical Church, Union Street, Newport. – Sunday 31/3/19 6.30pm Lake Green Mission, Percy Road, Lake. – Friday 7/6/19 7.30pm Wayfarers Fellowship, Castle Street, Carisbrooke. – Saturday 8/6/19 9.30am Wayfarers Fellowship, Castle Street, Carisbrooke. – Sunday 9/6/19 10.30am Ryde Elim, Albert Street, Ryde. – Sunday 9/6/19 6.30pm Ryde Elim, Albert Street, Ryde. Thank God that we have the promise from the scriptures in the latter part of Hebrews 13 verse 5 “Not at all will I leave you, not at all will I forsake you, never”(MKJV). This is a tremendous promise as we face each day life’s difficulties. At this present time there are so many we know personally facing major health issues. We of course commit them to our dear Lord’s care and pray that His will be done. There is another promise that we can hold onto found in Romans 8 verse 28 “ And we know that all things work together for good to those who love God, to those who are called according to His purpose”(MKJV). Are all things good? Of course not, but all things in Him can be worked for our good and that is our hope. With every blessing in Christ. Roy. Luke 22:41-44 KJV – ‘And he was withdrawn from them about a stone’s cast, and kneeled down, and prayed, Saying, “Father, if thou be willing, remove this cup from me: nevertheless not my will, but thine be done”. And there appeared an angel unto him from heaven, strengthening him. And being in an agony he prayed more earnestly: and his sweat was as it were great drops of blood falling down to the ground’. – Luke tells us of the anguish of Jesus in the garden of Gethsemane. Jesus was subservient to the Father , but that doesn’t mean he wasn’t fully God as well as fully man. I’m subservient to my manager at work and I do what she tells me to do. Although I’m subservient to her I’m also human like she is, her being my manager doesn’t change our essence, and we’re both human. In the same way, Jesus being subservient to the Father doesn’t change their essence, they are both God. Father sent an angel to comfort and strengthen Jesus to help him face the ordeal ahead. Luke, being a physician would most probably have been interested in Jesus sweating blood. Sweating blood is a very real condition called Hematidrosis. Hematidrosis is a condition in which capillary blood vessels that feed the sweat glands rupture, causing them to exude blood, occurring under conditions of extreme physical or emotional stress. The stress Jesus felt in the garden is beyond our comprehension. The fall of mankind began in a garden and part of our redemption also featured a garden. The King took our punishment and deserves our love, thanks and worship. Every blessing, Richard. We thank you for your continued encouragement and support.